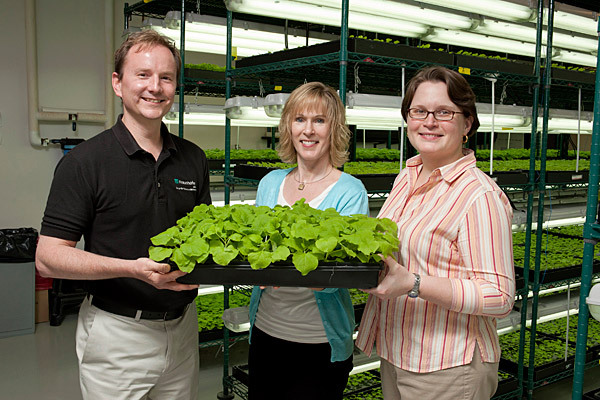 Pictured are researchers (from left) Mark Jones, Kristi Kiick and Jessica Chichester. Pictured are (from left) Alex Bott, Eun Hye Kim, Jung-Youn Lee, Alex Prokhnevsky, Weier Cui, Amanda Roberson, Xu Wang and Ross Sager. 9:28 a.m., June 20, 2012--Two collaborative research projects have been selected for funding under a six-year partnership agreement that includes the University of Delaware, the Fraunhofer Center for Molecular Biotechnology (CMB) and the state of Delaware. The two-year grants total $400,000 to support work to be conducted at UD and Fraunhofer. Kristi Kiick, professor of materials science and engineering and biomedical engineering at UD, is leading a project to develop and demonstrate the ability of engineered polymer gels to increase the stability, immunogenicity, and/or therapeutic efficacy of proteins produced by Fraunhofer. Kiick is collaborating with Jessica Chichester and Mark Jones at CMB on the project, which capitalizes on the capabilities of her lab in polymer matrix development and of Fraunhofer in new protein therapeutics. In contrast to most biologicals produced today, which are grown in either bacteria or yeast, CMB uses a novel plant-based system for rapid, cost-effective production of recombinant proteins. The polymer matrices produced in Kiick’s lab will be engineered for specific functions, including protein sequestration, protein stability, slow release, or immunological presentation. “With this combined expertise, we have the potential to develop unique formulations for a range of applications from vaccine development to toxin treatment,” Kiick says. Jung-Youn Lee, associate professor of plant and soil sciences, is partnering with CMB’s Alex Prokhnevsky to improve the efficiency of “molecular farming” of such pharmaceutically valuable materials as vaccines. Lee’s group has been working to understand how plant cells communicate through the intercellular connections unique to plant kingdom called plasmodesmata. They recently discovered that plants actively guard plasmodesmata in the face of attack from microbial pathogens. Prokhnevsky’s group uses tobacco mosaic virus (TMV) as a vector system to deliver and produce vaccines in tobacco plants, and Lee’s finding showed that the spread rate of TMV is controllable using her molecular system. Vidadi Yusibov, CMB executive director and research professor in biological sciences, points out that these collaborative interdisciplinary projects are focusing on some key areas of technology and pharmaceutical product development. “The resulting unique knowledge will facilitate conversion of basic research concepts into applicable data, which will lead to the establishment of uniquely positioned, highly competitive research teams of UD faculty and Fraunhofer scientists,” he says. On July 14, 2011, UD President Patrick Harker, Delaware Economic Development Office Director Alan Levin, and Fraunhofer USA President Georg Rosenfeld signed a partnership agreement that combines the strengths of the Fraunhofer Center for Molecular Biotechnology in applied translational research and of UD in basic research. Centered in the life sciences, the partnership is expected to lead to the development of innovative, interdisciplinary programs and create educational and economic benefits for the state. An inaugural Fraunhofer-UD Research Symposium, “Energy and Life Sciences - Solutions for Sustainability,” is planned for Oct. 29 at UD’s Clayton Hall.